In the exhibition area, the “rational and mechanical” modular scaffolding system conducts a dialogue with the life force of the dinosaurs that is “primal and organic”. While the rough scaffolding balances out the dinosaur’s gigantic scope, the gradient of the lighting, which seems to breathe, creates a spatial concept that is contrasting yet harmonious between the cold, blue-light scaffolding and the warm, yellow-light dinosaurs. The exhibition area is like a cloud in the space, fusing with the dinosaur to become one being. The main spatial elements of the design are the scaffolding and the light screens, which also indicate the line-volume contrast between the dinosaur skeleton and the full dinosaur in the exhibition. The “linear” scaffolding constructs the main spatial frame of the space, whereas the “planar” light screens climb onto the scaffolding, folding and forming white volumes that surround the dinosaurs, like melodic notes jumping forward rhythmically. Through frames formed by the hollow scaffolding and the gaps between the light screens, the features of the dinosaurs inside are gradually revealed. Those frames also form a vague boundary within the exhibition hall that blurs the areas of the inside and the outside. The space features a belt of lights like a lightning bolt. As if a three-dimensional trail for sightseeing, it directs people’s attention among the scaffolding, creating diverse points of view from various angles, high and low. The viewers are like dinosaurs of different sizes looking at their companions. This design provides the viewer with unique feeling of interaction with the art. 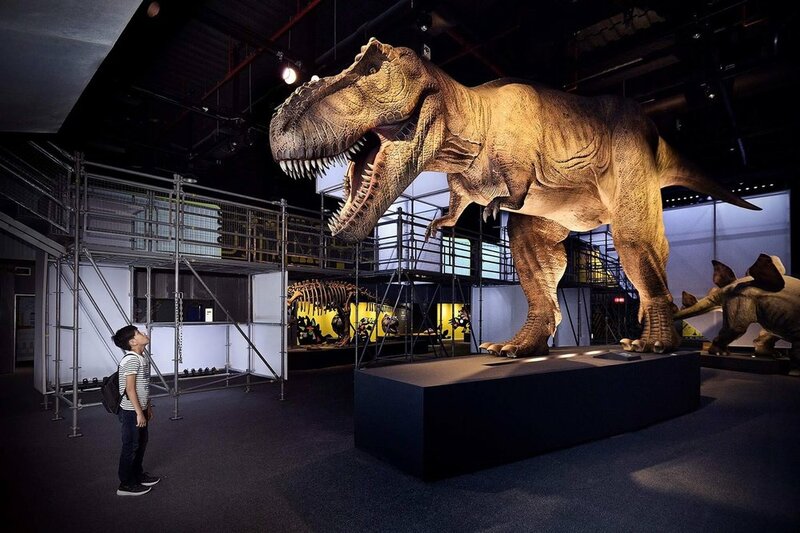 Through our spatial designs, we hope that, as the adults and children appreciate the dinosaurs, we may provide them with an unforgettable spatial experience, conveying new possibilities for dialogue between mankind and nature, as well as between the viewer and the view. 展場空間透過鷹架“ 理性而機械”的模矩系統去與恐龍“原始而有機”的生命力對話. 在透過鷹架的粗獷去平衡恐龍的巨大的同時, 引入明暗漸層會呼吸的燈光, 在冰冷藍光的鷹架與溫暖黃光的恐龍之間創造出一種對比卻調和的空間感. 展區就像是空間中的一朵雲, 與恐龍融合為一. 設計上運用鷹架與光幕作為主要的空間元素, 也暗示著展場內恐龍骨骼與完整恐龍間線條與量體關係. “ 線性” 的鷹架構築出場景的主要空間框架, 而” 面狀” 的光幕則攀延著鷹架翻折出跳動的白色量體, 圍繞著恐龍如音符般韻律的往前躍動, 透過摟空鷹架與光幕塊體縫隙間的框景, 循序漸進的揭露出內部恐龍的面貌. 並在展場內圍塑一條隱約的邊界, 模糊內與外的區域. 在空間中劃出一條閃電般的燈帶, 形成一條立體的觀賞步道, 引導著人們穿梭在鷹架之間, 創造出高低多元的觀賞視角, 讓觀者彷彿是不同大小的恐龍般注視著同伴們, 提供觀者一種獨特的互動感受.